"My mind is my weapon." Lions of Casterly Rock #2. I really, really love this Tyrion. Tri-Cons are powerful on their own. Add in his ability and you are pretty dominant. However, there is a great danger with removing your own characters from the board. The Jon Snow (WoTN) ability is great, but there are situations where if you remove too many, you’re in trouble. Or, you may never get to do so because you cannot afford to reduce the board state any further. 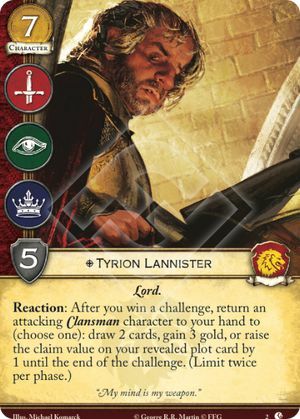 Plus, I rank Tyrion (Core) as my 3rd best character in the entire game. It’s really hard competing against him where Core Tyrion is outstanding in any deck, and Lions Tyrion is only good in clans decks. You choose among the three options when the effects start resolving, after the opportunity to cancel their initiation has already passed. Like all reactions, Tyrion's ability can be used once per triggering condition. In other words, once per challenge, with a further limit of twice per phase.